The finale of my presentation at TEDx Gull Lake 2017 was my song “Hold On,” about the eccentric soap-maker, Dr. Bronner. Dr. Emanuel Bronner is the creator of Dr. Bronner’s magic soap, the natural soap that is a favorite among natural soap lovers. Those of you who don’t think you know his soaps may have seen them. They are the bars and bottles of soap with labels covered with so much writing in such small print that you can’t believe anyone would have that much to say about soap. And if you were to read those labels, you would learn they are not about soap at all, rather they share Dr. Bronner’s fundamental philosophy that we are all connected, or in his words, We Are All One. 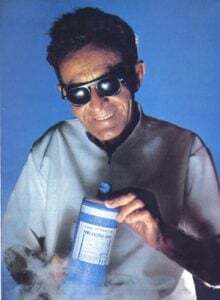 Dr. Bronner came to the United States from Germany and starting preaching his ideas on streetcorners, for which he was committed to an insane asylum. He escaped and built a natural soap empire to spread his philosophy that we are all connected. My song, “Hold On,” tells his story. Scroll down to listen to audio. How do I tell people what I know? Win victory, & all stand by you; give up? All deny you!